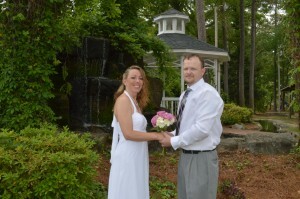 Dianne Renee Tyler of Scranton, South Carolina and Robert Iven Hickson of Effingham, South Carolina were united in marriage on May 11, 2013 at Wedding Chapel by the Sea in Myrtle Beach, South Carolina. Dr. Terrence Grainger officiated. A reception followed. The bride is the daughter of Brenda and David Williams and Stewart and Susan Tyler. She is the granddaughter of the late James Hatcher and Ruby Hartle and Hugh and Idella Tyler. The bride’s attendants included Kimber L. Tyler of Scranton, South Carolina; Victoria M. Hickson of Florence, South Carolina; and Saphire M. Williams of Mountain Top, Pennsylvania. The groom is the son of Martha Joanne Hickson and the late Samuel Elijah Hickson. He is the grandson of the late Carl and Silema McElveen and Elijah and Emma Hickson. The groom’s attendants included David Williams of Mountaintop, Pennsylvania; Sully C. Hickson and Ethan A. Hickson both of Effingham, South Carolina. The couple will reside in Scranton, South Carolina.